This colorful plush chair adds a modern flair to casual seating. 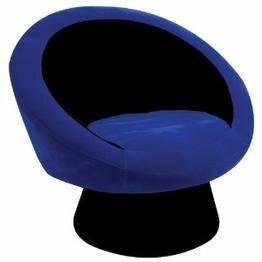 The Saucer Chair is great for your teen or dorm room! Comfortable padding with bright blue plush upholstery over sturdy wood frame gives a vibrant, fun excuse to sit and relax! Features: Plush fabric upholstery Sturdy wood frame Blue color Contemporary design Specifications: Overall dimensions: 28 H x 32.5 W x 26.5 D Weight: 36 lbs. If you have any questions about this product by LumiSource, contact us by completing and submitting the form below. If you are looking for a specif part number, please include it with your message.